Glance to the right of this article and you’ll see ads geared towards bike safety. Sift through the work of this site and you’ll find endless accounts of dooring, commuter frustration, measures to keep one safe, how to “properly” ride a bicycle, riding on sidewalks… The list is as exhaustive as it is important despite its seeming redundancy. And Long Beach is taking impressive steps forward in maintaining an aura of safety–particularly as the number of bicycle-related crashes rise with the increasing number of cyclists. The first and the last account for about 55% of all bicycle-related crashes. What makes the data more fascinating is the fact that, despite who was at fault, a driver was involved 40% of the time, mostly making a right hand turn. 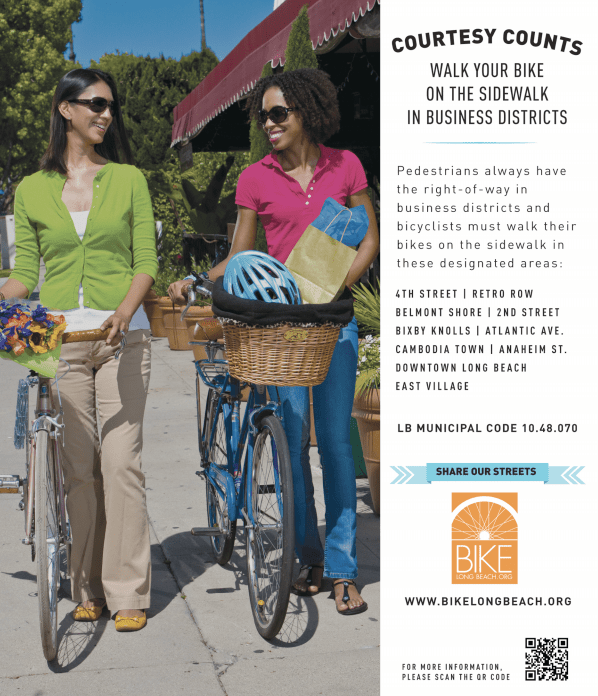 To help curb these numbers and educate the masses, the “Share The Streets” campaign–a collaborative effort between Bike Long Beach, The City of Long Beach, Long Beach Transit, and Metro–has been launched. One can easily call one of the most comprehensive cycling safety programs initiated by a municipality. While separated lanes and sharrows go a long way to help alleviate safety problems, they can’t solve everything. It ultimately comes down to a matter of cyclists and motorists knowing how they should behave. Intriguingly, this campaign goes beyond those givens and beyond advertising, which has been plastered throughout the city since October on buses and lamppost fliers alike. They are encouraging everyone, particularly businesses, to hop on their newly designed website and download printable pocket guides, posters with tips, and advertisements to keep at their businesses so that, for example, the business has something to hand out when cyclists ride dangerously on the sidewalk or motorists drive unsafely. And all, of course, are available in Spanish and English. Visitors can access registration for various classes, workshops, and tours. Want to take a group of students or employees or friends to a free course regarding traffic safety? They’re happening every month at CSULB until February of next year. Curious about your neighborhood? Tours will launch next year that take riders on an accessible 3- to 5-mile ride to examine parks and green spaces, local businesses, and the historical aspects of architecture and space. Want direct training on how to ride your bike or explore by foot the safest way possible? Free “rodeo” clinics–conducted by none other than Safe Moves–for all ages offer hands-on, interactive training that focus on being visible as a cyclist, learning which direction to ride, and how to obey signs and signals. CSULB, beyond offering courses, has installed Dero Fixits at both its Student Recreation and Wellness Center as well at its residences. These DIY stations permit cyclists to hang their bikes and access tools needed to adjust their cycle’s woes. A QR code can be scanned by their smart phone which helps the student sort through help to pin point their bike’s problem and instructions on what to do. And during active semester, the second of Wednesday of each month hosts local bikery JAX to offer students free brake checks, tire straightening, chain tension adjustments, lubrication, gear shifting adjustments, and other essentials that help one’s ride become safer. In its attempt to become the most bike friendly city in the nation, it seems like Long Beach is also trying to be the safest. Re wrong-way riding: I recently had a conversation with an older bicyclist who asked me about whether wrong-way riding was illegal. He said that, when he was a kid with a paper route, he was taught to ride on the wrong side of the street facing traffic. I told him that it was illegal and, more importantly, unsafe–that being struck from behind is relatively rare while wrong-way collisions are quite common. There happened to be two LAPD officers standing nearby. The man sought a second opinion, and they confirmed that wrong-way riding was both illegal and unsafe. The man said he would continue to ride the wrong way so he see if a vehicle was headed toward him and he could jump out of the way. In short, wrong-way riding is often a response to the fact that bicyclists do not feel safe riding on streets–and no amount of education is going to change that behavior. Jeff…I disagree with you regarding the value of education. In Long Beach we have been focusing on reducing wrong way riding for the past few years. We have focused on it in the schools, through our Safe Routes to Schools program that touches each and elementary and middle school kids (LB kids are told…don’t ride the wrong way…it isn’t safe) as well as through our media outreach program. 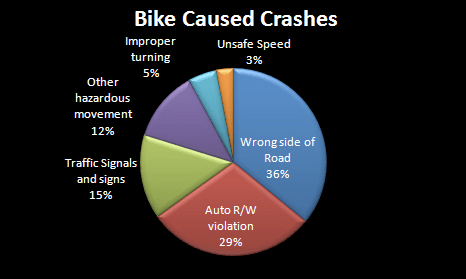 The result….based on our annual bike counts…we have seen a nearly 50% decrease in the number of wrong way riders. Education makes a difference!!!!! The entire country of Belgium has legal contraflow bicycle riding on one-way streets. For ten years.